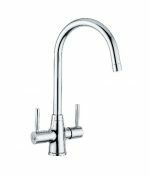 A customer recently asked us to help her match a kitchen tap with Deca 150 Sink that she was buying from us. 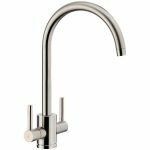 We immediately recommended a tap in a brushed nickel finish. The Deca 150 Sink has a beautiful stainless steel look to it and consequently we would consider it more ‘matt’ than ‘shiny’. 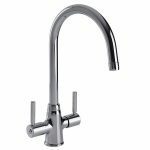 While you can of course put a chrome tap with it, our preference would be for a matt tap. 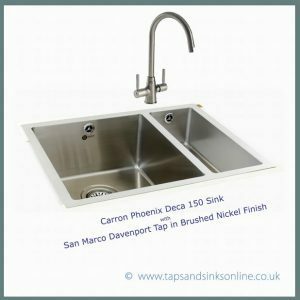 After much consideration (lots of opening of tap boxes to put beside the sink 🙂 ) we unanimously agreed that the San Marco Davenport Tap in brushed nickel finish was the perfect match with the Deca 150 sink. 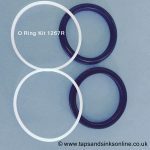 We order and query and chase and chase, and we forget the equally important part – to say THANK YOU for a super service. The sink and taps arrived on Wednesday last. And you were totally correct, a perfect match.